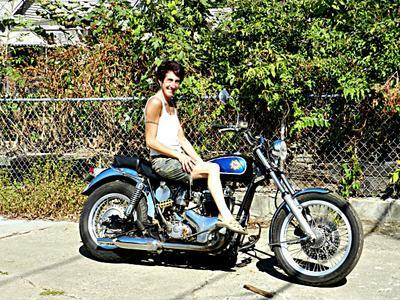 I started this BSA project with just a motor and trany that I found. The bike is a hard tail frame. I removed the tail section and grafted a 499 twin Yamaha tail section and a xs 650 Yamaha swingarm with a hollow swingarm bolt. The rest of this project was the result of a lot of donor bikes. I didn’t want to reinvent the wheel, so I adapted it. This bike handles great and is a blast to ride!